Hamoudi Fayad writes a detailed tactical analysis about the Manchester City Real Madrid goalless draw in the UEFA Champions League semi final. The match between Manchester City and Real Madrid ended as a stalemate, which is usually an indicator of a boring game. The fact that both teams could barely muster a shot at goal for the first hour strengthens that argument. Yet from an analytical point of view it was quite interesting, especially given the fact that this is a Champions League semi-final. Tactically, Atletico Madrid and Bayern Munich are most certainly miles ahead of the pair that played the first leg at the Etihad Stadium. One will question what Zinedine Zidane has changed since his appointment as Real Madrid’s boss, other than better results. Philosophy-wise, Real Madrid are quite one-dimensional and as in the Barcelona game a few weeks ago, it took the last half an hour for them to emerge from their block and form a good set of chances. Meanwhile, Manuel Pellegrini should not be happy with the result achieved. Whether they can hold on in Madrid will depend on whether they are able to keep a compact shape and avoid the concession of an early goal. Sure, Manchester City’s block was better than it often is in this game but Real Madrid’s avoidance of these areas (more on this later) was a main factor. Manchester City: 1. Hart; 3. Sagna, 4. Kompany, 30. Otamendi, 22. Clichy; 6. Fernando, 25. Fernandinho; 15. Jesus Navas, 17. Kevin de Bruyne, 21. Silva; 10. Aguero (4-2-3-1). Real Madrid: 1. Navas; 15. Carvajal, 3. Pepe, 4. Ramos, 12. Marcelo; 14. Casemiro; 11. Bale, 19. Modric, 8. Kroos, 18. Vazquez; 9. Benzema (4-1-4-1). Manchester City started the game on the front foot, keeping the ball for a good 10 minutes against Real Madrid’s mid-block. Yet, they failed to actually progress up the pitch without having the need to call for their centre backs to do so themselves. This was a pattern that continued throughout the game, with no success for City. 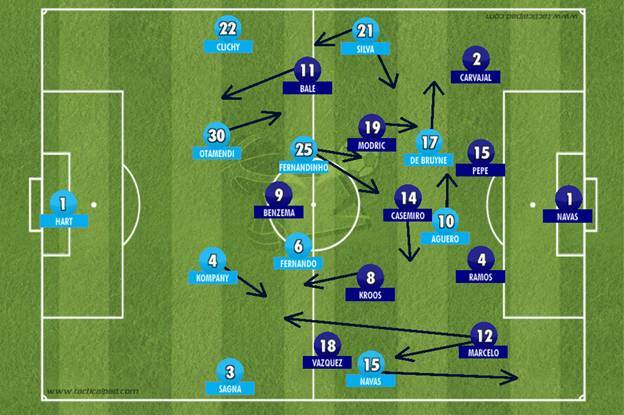 Fernandinho and Fernando work well in a double pivot, however their qualities don’t suit City’s squad. Otamendi and Kompany are proactive centre backs on and off the ball, which means they have the propensity to move out of their defensive block. Yet, there is only Fernando who is able to cover for both and the latter is being scrutinized for his inability to play 90 minutes at times. Add to that Fernandinho’s press heavy style which leaves a large gap behind him. 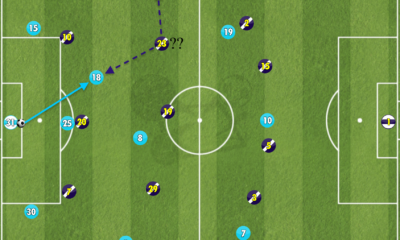 Moreover, Fernandinho and Fernando lack the certain on-ball qualities to improve City in the centre of the pitch. Yaya Toure at the very least adds a sense of drive, but one can argue that Fernandinho himself is better without the ball and so is Fernando. This ultimately led the centre backs to do the job, beat the first pressing line and play the ball into the attacking midfielders. Although the centre backs did do well by bringing the ball out, it created a different structure for City that could have been penetrated had Real Madrid won the ball in midfield. With Real’s man-oriented pressing, there was a larger possibility of the same happening especially with Fernando not offering the positional awareness of someone like Casemiro. City’s counter-pressing shape is not ideal, which means in any case there is a great risk in bringing the ball out from two defenders who have had an up-and-down season. Real Madrid on the other hand, started off extremely cautiously. It was obvious that Zidane formulated a plan that would clearly overestimate the opposition, as the underestimation of Wolfsburg saw them lose in the first leg. Moreover, Manchester City are the weakest team left in the Champions League and the ideal draw for Real, which could usually lead to calm, careless feelings from the players in the Madrid camp. They sat in a 4-1-4-1 and often a 4-1-5-0 where Benzema dropped into midfield to force Manchester City’s defenders away from the centre. The flanks were relatively weak for Manchester City in general, as they created tenuous links between the wingers and full backs. Any obstruction of Real’s block was met with Casemiro, who shifted from half space to half space with relative ease and welcomed the support of Kroos and Modric, one of whom dropped beside Casemiro depending on City’s direction of play. But it was in possession where Real Madrid failed. Their possession game was lackluster and seemingly unplanned, with a severe lack of proactivity and urgency from the midfielders. In the first 15 minutes, whenever Fernandinho pressed Modric or Kroos, leaving a gaping space behind him, the midfielders would shift the ball out wide to Marcelo who was clearly blocked in between City’s two banks of four. What Navas and Sagna didn’t offer in attack on the night, they offered in defence by shutting out one of the best left backs in world football for a period of time. To battle this, Marcelo started to cut inside from the left while Bale moved out to the left wing and combined with his Brazilian teammate to create Madrid’s best chances of the night. Yet, that was the epitome of Real Madrid’s weak possession game where they could only create their best chances from the work of two individuals. Centrally, Modric was being wasted. Whether it was Zidane’s ploy to do so or not, Modric could have breached the City midfield line (non-existent at times) to enter the final third and create chances from there. The team as a whole played their passes towards the flanks very often, it even came to a point where Jese was free to receive in the final third yet Modric chose the option on the flank. Jese proceeded to get mad at Modric’s reluctance to pass into the centre. This created a predictable pattern that City were easily able to combat for most of the first hour. Although City did show glimpses of good combination play when they broke through Real Madrid’s compactness twice in the first 15 minutes, they failed to create adequate connections across the pitch before Iheanacho came on for David Silva. Jesus Navas and Sagna were separated, far away from each other with no central midfield connecting them via a triangle either. On the other side, David Silva dropped into the left half space often to help the build-up play while De Bruyne shifted out to the left wing to draw out Casemiro to no avail. Aguero struggled too, as he failed to get on the ball enough to cause a threat to Real Madrid’s defenders. Once Iheanacho entered the pitch, Aguero’s chances to receive the ball and dribble increased as De Bruyne was at that point firmly stationed on the left wing. Iheanacho was able to drop from the front line into Zone 14 while Aguero moved to the edge of the box to receive the ball, and vice versa. This however, barely improved City’s chances over the course of the second half. Real Madrid took advantage of their 2-man midfield, pushing Bale out on the left to make diagonal runs in behind them – retrospectively to no avail. Despite the changes made by Real Madrid to compensate for their lack of attacking thrust in the first half, they failed to exploit City where it counts and got the better of their opponents via players’ individual brilliance. Meanwhile City proved that they desperately need a new pair of midfielders, and Guardiola will most certainly deliver in that sense. City may struggle against Real Madrid at the Bernabeu, but their resilience and improved defensive shape plus the rejuvenation of Otamendi in defence and the wall in Joe Hart can be the key to breaking Real Madrid’s possible attacking approach at home. One thing to note is – and people may disagree with me on this – but Ronaldo’s presence in this game may have given City the advantage, and not Madrid. This is because Vazquez made sure of Real’s compact shape, meanwhile Ronaldo would have only added individual brilliance to a side abundant in that aspect for this game anyway. Hamoudi is a writer who admires tactically analysing football games whether it is the La Liga or the Lebanese Premier League. He also has an interest in the psychological side of the game. Written for ContinentalZone, Footynions, Justfootball. Co-Founder of Middle Eastern football website Ahdaaf(.me). Dislikes the lack of tactical intelligence in the English Premier League. Obsessed with defensive midfielders.